Good afternoon. My name is Sandy Reider, I am a primary care physician in Lyndonville, and I have been practicing clinical medicine in Vermont since I received my license in 1971. In the interest of full disclosure, I am not being paid for involvement in this issue, nor did I seek this out; rather, it found me by way of a patient I had known well for several years, and who, in late 2011, suddenly developed severe insomnia, anxiety, headaches, ringing ears, difficulty concentrating, and frequent nausea, seemingly out of the blue. This puzzled us both for a few months before we finally came to understand that he suffered from what was, then, a relatively new clinical entity known as “wind turbine syndrome”, related in his particular case to the comparatively small NPS 100 KW turbine that began generating power atop Burke Mountain in the fall of 2011. In the course of the 2012 legislative session, I described this patient in detail in testimony for the Senate Natural Resources and Health Care Committees, as well as the Governor’s Siting Commission. Since his symptoms were so typical and similar to those described by thousands of other individuals living too close to large wind turbines all over the globe, I have attached my testimony for the Senate Health Care Committee and encourage you to review it for its very characteristic description of what it is that this board, I trust, hopes to mitigate by recommending more protective sound standards for these industrial wind installations. I should add that I have seen 4 additional patients living close to the large Sheffield and Lowell projects, as well as an individual living near another single NPS 100KW turbine in Vergennes. All presented with similar, though not identical, symptoms to those described in my testimony. That there have already been so many complaints here in Vermont related to wind turbines suggests that the current noise standards may be inadequate. Either the utilities have been regularly out of compliance with the current existing standards ( Shirley Nelson’s detailed daily records suggest this has indeed occurred with some regularity ) and/or that the scientific data and studies upon which the current noise standards are based is incomplete, or possibly just plain wrong. Firstly, I do not doubt at all that these large turbines can and do cause serious health problems in a significant number of persons living nearby, even though the vibrational-acoustic mechanisms behind this harm are not yet completely understood (1,5). Repetitive sleep disruption is the most often cited adverse effect, and disturbed sleep and its resulting stress over time is known to cause or exacerbate cardiovascular illnesses (2, ), chronic anxiety and depression, as well as worsening of other pre-existing medical problems . This is especially concerning for the most vulnerable among us …. children, the elderly, those who are naturally sensitive to sound, or prone to motion sickness or migraine headaches, and, as mentioned, those who are unwell to start with. The position adopted by developers of large industrial wind projects, and thus far supported by regulatory and health agencies, has been that there is no evidence of a direct effect on health from wind turbines; rather, that the claimed adverse health effects are indirect, due mainly to the individual’s negative attitude about the wind turbines ( so-called “nocebo” effect ), and therefore it is their fault, it’s all in their heads, and so on. Not only is this incorrect, it is disingenuous. There is simply no clinical justification for ignoring harm being done to individuals and communities, whether direct or indirect, on these grounds ….. simply put, harm is harm, whatever the mechanism. The wind industry’s assertion that the Kelley study is irrelevant and that infrasound levels are negligible with the current, newer turbine design and may be ignored is unfounded, and more recent evidence confirms this ( 2012 Falmouth study by Ambrose and Rand ( Bob Thorne’s excellent quality of life study in 2011 (12); Steven Cooper’s preliminary results in Australia, final results due in September 2014 (11); and others ). The aforementioned studies were performed by independent professional acousticians not connected to the wind industry. Incidentally, the severely affected patient described in my 2012 testimony never did perceive any audible noise from the turbine ( and this is quite typical, the sound is more felt than heard ), nor did he harbor any feelings pro or con about the installation when his problems began, though after he understood the source of his ill-health, I have no doubt that the “nocebo” effect may have added to his stress, adding insult to injury. He has since abandoned that home, and is once again sleeping soundly and feeling well. The current sound standards, based as they are on dBA weighted acoustic measurements, gives particular weight to audible frequencies in the soundscape, but very little or no weight to low sound frequencies and infrasound, particularly below 10 Hz, which comprises a significant proportion of the sound generated by large turbines . People do not hear dBA, they hear qualitatively different sounds, birds, insects, running water, wind in the trees, etc. …. basing noise criteria solely on this single number ignores the unique nature of the sound produced by large wind turbines, with its constantly changing loudness, frequency, harmonics, pitch, and impulsive quality. It is precisely these qualities that make the sound feel so intrusive and annoying, especially in quiet rural environments where these projects are usually located (12). Parenthetically, the word “annoying” is somewhat misleading, as it implies a minor, temporary, or occasional nuisance that perhaps might be mostly ignored, rather than what it is: a repetitive stressor that can degrade one’s short and long term health and well being, and from which there is no escape over the lifetime of the project short of having to abandon one’s home. It is worth repeating here that the current Public Service Board threshold of 45 dBA of audible sound, averaged over an hour, has never been proven safe or protective, and that most studies agree that audible sound should not exceed 35 dBA, or 5dBA above normal background sound levels. (this is especially important in rural areas where background noise is minimal). The level should be a maximum , not an hourly average. Above 35 dBA there are likely to be significantly more complaints, particularly difficulty sleeping. I am aware that the members of the PSB bear a heavy responsibility for Vermont’s overall energy future and have many other issues on their plate besides this one. Rather than presenting you with a long list of literature references most of which would likely go unread ( but they are included just in case ), I recommend a careful review of just one study in particular: Bob Thorne, a professional acoustician in Australia, presented an excellent and well thought out clinical study to the Australian Senate in 2011 (12). It really does cover the waterfront, including WHO quality of life measures, audible and infrasound measurements, and health measures, in a balanced and scientific way. For your convenience there is a hard copy of this study included with my presentation today. His comprehensive ( including the full sound spectrum, not only dBA weighted sound ) and protective recommendations for sound criteria are reasonable, and if adopted, would be likely more acceptable to neighboring households and communities. However, given that wind developers are these days building bigger turbines atop taller towers in order to maximize power generation and profits, adoption of these safer limits would necessitate siting the installations farther from dwellings …. A 1-2 km setback is not nearly sufficient; significant low frequency sound pressure measurements have been recorded in homes 3-6 miles from large projects in Australia. 2. Criterion: An LAeq or ‘F’ sound level of 22 dB(A) or above over any 10 minute interval inside a dwelling with windows open or closed. 3. Criterion: Measured sound levels shall not exhibit unreasonable or excessive modulation (‘fluctuation’). 4. Criterion: An audible sound level is modulating when measured by the A-weighted LAeq or ‘F’ time-weighting at 8 to 10 discrete samples/second and (a) the amplitude of peak to trough variation or (b) if the third octave or narrow band characteristics exhibit a peak to trough variation that exceeds the following criteria on a regularly varying basis: 2dB exceedance is negligible, 4dB exceedance is unreasonable and 6dB exceedance is excessive. 5. Criterion: A low frequency sound and infrasound is modulating when measured by the Z- weighted LZeq or ‘F’ time-weighting at 8 to 10 discrete samples/second and (a) the amplitude of peak to trough variation or (b) if the third octave or narrow band characteristics exhibit a peak to trough variation that exceeds the following criteria on a regularly varying basis: 2dB exceedance is negligible, 4dB exceedance is unreasonable and 6dB exceedance is excessive. 6. Definitions: ‘LAeq’ means the A-weighted equivalent-continuous sound pressure level ; ‘F’ time-weighting has the meaning under IEC 61672-1 and ; “regularly varying” is where the sound exceeds the criterion for 10% or more of the measurement time interval  of 10 minutes; and Z-weighting has the meaning under AS IEC 61672.1 with a lower limit of 0.5Hz. 7. 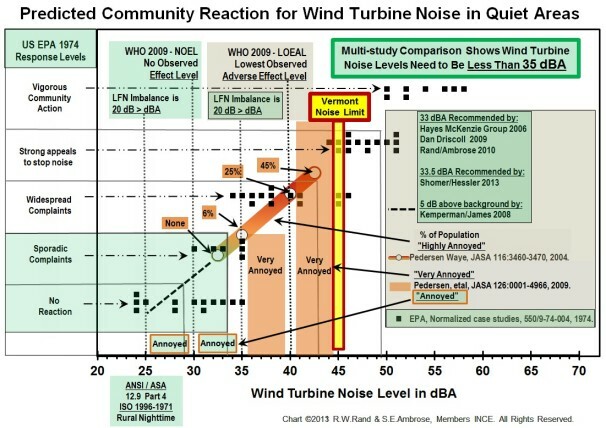 Approval authorities and regulators should set wind farm noise compliance levels at least 5 dB(A) below the sound levels in criterion (1) and criterion (2) above. The compliance levels then become the criteria for unreasonable noise. To exclude careful independent well designed case studies like Thorne’s ( and others ) in a review of the scientific literature that purports to be thorough is, I repeat, a serious omission and is not “scientific”. Careful consideration of these independent well done studies, if nothing else, should encourage regulatory agencies to adopt a much more precautionary approach to the siting of today’s very big industrial wind projects in order to adequately protect public health. For better or worse, in today’s “information age” we are perhaps too fascinated by computers and mountains of data, but truth is truth, wherever you find it, even in small places. Thank you very much for taking the time to address this issue, and for listening. *Many thanks to Sarah Laurie, CEO of the Waubra Foundation, for her tireless work, and generosity in sharing so much information.